The bezel-less train has left the smartphone industry and almost all the manufacturers are on board. Next stop? Why, the laptop segment of course! 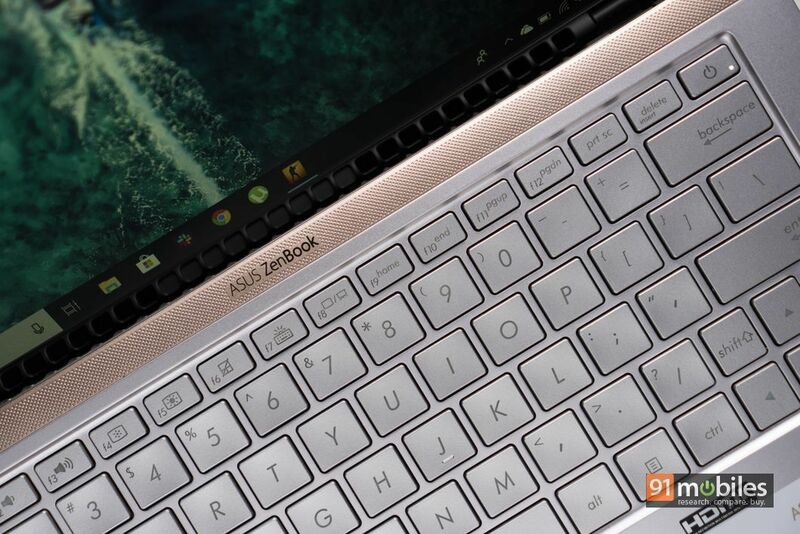 While we’re yet to see widespread adoption of the bezel-less trend in laptops, it’s safe to say that companies like ASUS have set the ball rolling. The Taiwanese giant took to the stage at IFA and debuted its latest ZenBook line, with laptops that feature razor-sharp bezels and astonishing screen-to-body ratios. The machines have now made their way over to the Indian shores, which brings us to the review of the ASUS ZenBook 13 (first impressions). I’ve been putting the laptop through its paces for a week and here’s why I think you should pick one up. Let me get the obvious out of the way first – the ZenBook 13 is simply put, among the most compact 13-inch laptops you can buy in the market. In fact, the company proudly claims that the machine is smaller than an A4 paper sheet! Now, I’ve been using the laptop for over a week, but I’m still baffled by its tiny footprint. Rest assured, you should have lots of space in your travel bag for other stuff even with the ZenBook 13 safely ensconced inside. To give you a better picture of the laptop’s compact dimensions, here’s an image comparing the newer model with its predecessor, the ZenBook 13 UX331 (review). While both the laptops were announced last year, the newer ZenBook 13 UX333FN is 14 percent smaller in size. What a difference a few months can make, amirite? 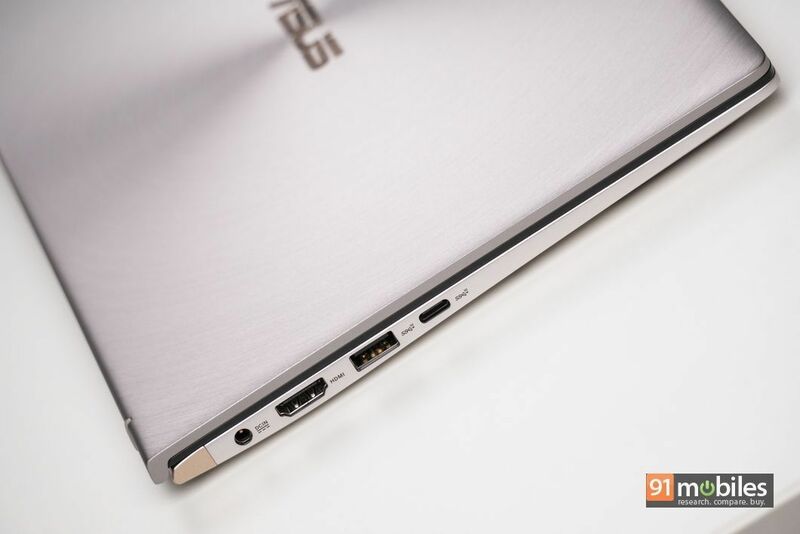 Clearly, ASUS has nailed the portability aspect on the newer ZenBook 13. But, what about the rest of the design? Well, I’m glad you asked. The ASUS ZenBook 13 has been constructed in entirety using metal which lends the device a premium in-hand feel. My review unit shipped in a silver colourway, but the company also offers the laptop in its signature Royal Blue hue, which looks stunning, to say the least. I recently reviewed the brand’s ZenBook Flip S which sported the same paint job and I couldn’t take my eyes off the machine. 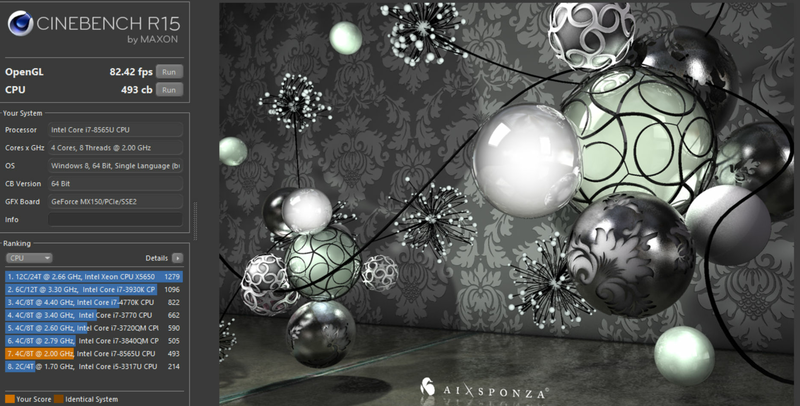 That said, the silver finish attracts fewer fingerprints, so choose wisely. As pretty as the ZenBook 13 is, it’s no delicate darling, mind you. 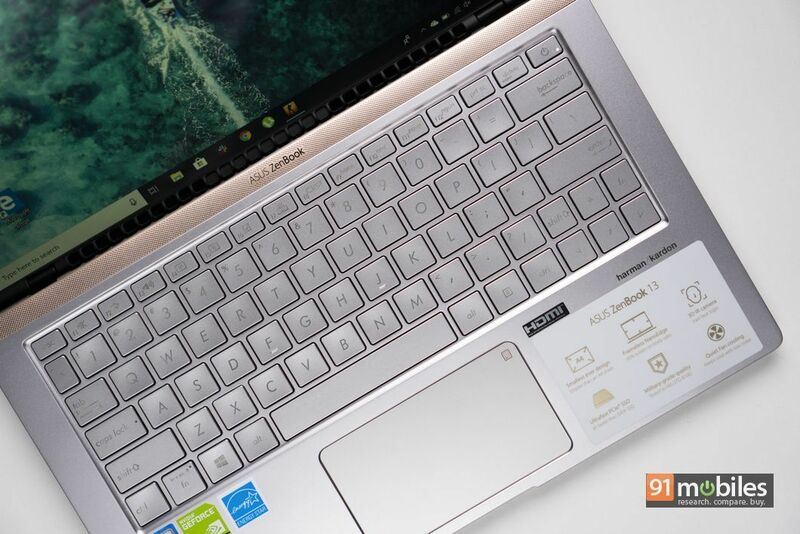 ASUS’ latest offering comes with MIL-STD 810G certification, meaning it has survived punishing tests in harsh environments and therefore, should last office-goers a long while. What’s more, thanks to the laptop’s metal construction, there’s no hint of flex around the unit’s lid or the base and the hinge mechanism isn’t wobbly either. 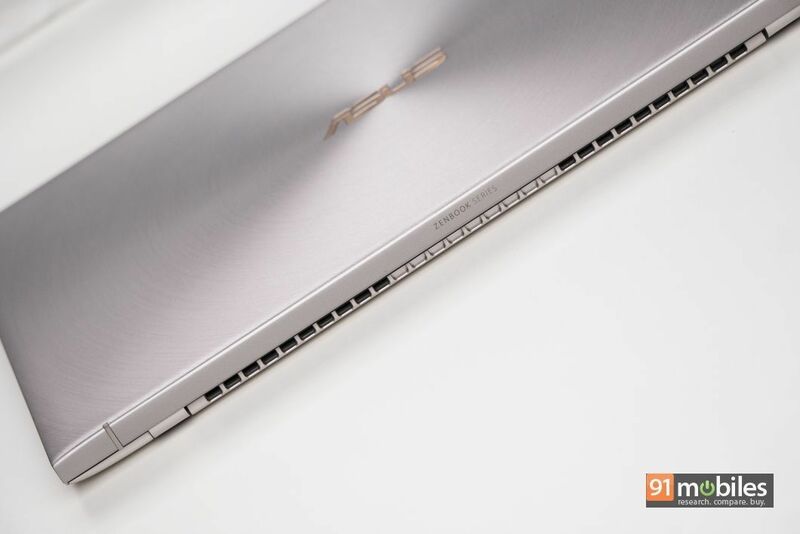 Speaking of which, ASUS has employed its custom ErgoLift hinge in the design of the ZenBook 13 which lifts the laptop’s chassis ever so slightly when the lid is opened to give users a comfortable typing position. 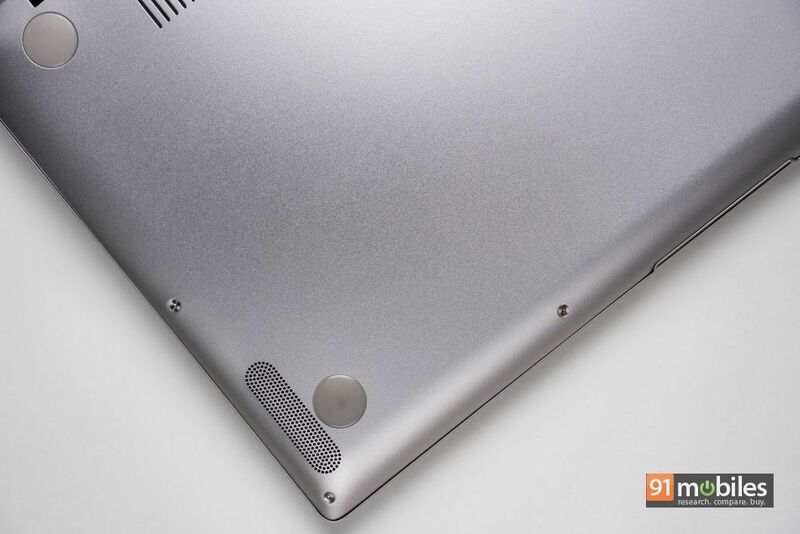 A fringe benefit of the same is that it helps keep the laptop cool and frosty to the touch under intense workloads. That being said, since the ErgoLift hinge doesn’t ship with rubberised grips at the bottom, the laptop tends to slide every now and then when kept on a flat surface. It’s a minor issue but worth noting. Unfortunately, the laptop’s metal construction coupled with the MIL-STD 810G translates into a bit of heft – 1.2 kilos to be precise. It’s not going to weigh your shoulders down but, you will definitely feel the weight when carrying the laptop around. 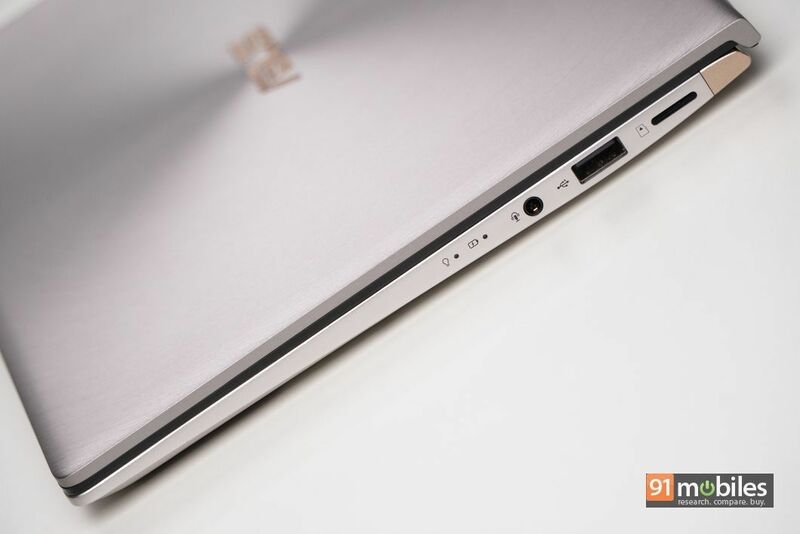 What’s more, the laptop isn’t the slimmest in the market either and features a girth of 0.67-inches. 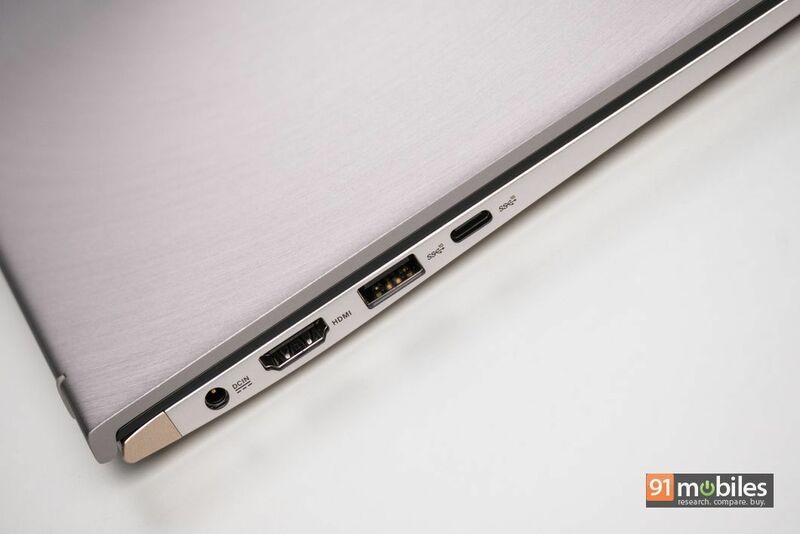 But, in the company’s defence, you do get a wide array of ports to connect accessories to the ZenBook 13 and the unit features a USB Type-A 2.0 port, a USB Type-A 3.1 port, a USB 3.1 Gen 2 Type-C port, a full-sized HDMI slot as well as a microSD card reader. I was a bit disappointed in the company’s decision to omit a Thunderbolt 3 port but, it’s not the end of the world considering the laptop ships with a dedicated GPU from Nvidia. The USP of the new ZenBook 13 is its gorgeous 13.3-inch full HD IPS display which canvases 95 percent of the laptop’s front fascia. Now, you don’t have to be a CBSE topper to know how impressive that number is. The display on the ZenBook 13 is as immersive as it gets, and during my time with the machine, I never once noticed the bezels bordering the display. Moreover, thanks to the display’s excellent viewing angles and vivid colour reproduction, movie buffs will adore consuming media on the ZenBook 13. My only complaint with the panel is that it’s quite reflective and therefore, you’ll struggle to use it in well-lit environments. 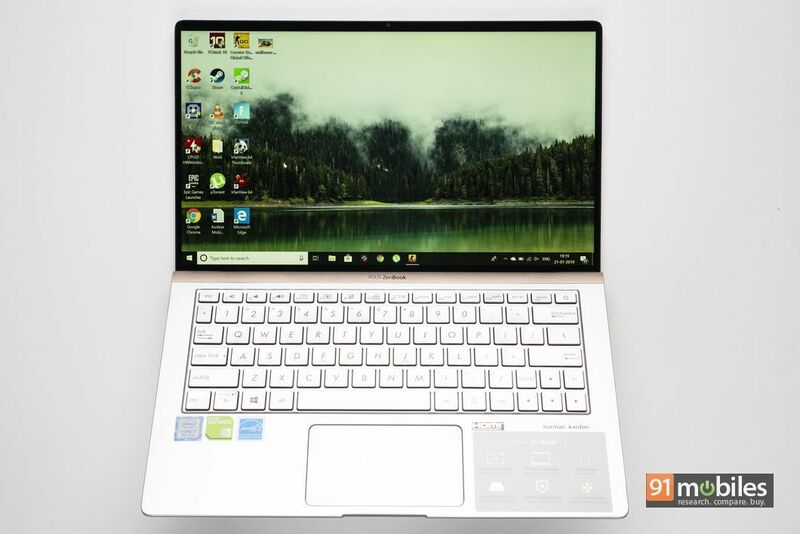 The ZenBook 13’s compact chassis comes at a cost as buyers opting for the device will have to settle for a tightly-packed keyboard and a relatively small touchpad. For what it’s worth, I quickly got acclimated to the laptop’s keyboard and was able to type at my usual speed without making many typos. In fact, barring the right shift key which is abnormally small, I didn’t face any issues with the keyboard during my stint with the machine. On the flip side, I wasn’t quite sold on the unit’s trackpad, which was just way too small for my pudgy fingers. That’s quite a shame because the trackpad comes with support for Windows Precision drivers and a switchable NumberPad too. 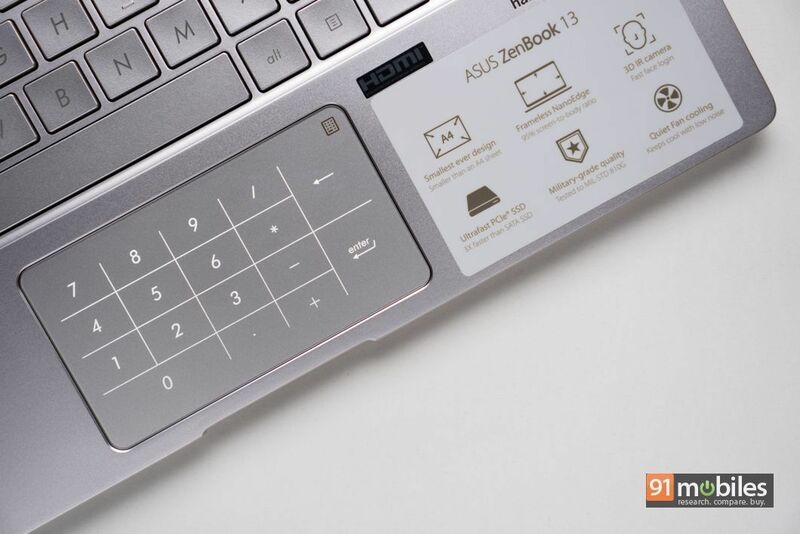 If you’ll notice closely in the design shots, you’ll spot a tiny Numpad icon towards the top of the touchpad, tapping which brings up full-sized numeric keys on the touchpad itself. What’s more, even with the Numpad on, the trackpad retains its cursor function which is great for scrolling through different cells in an excel sheet and jotting down numbers. 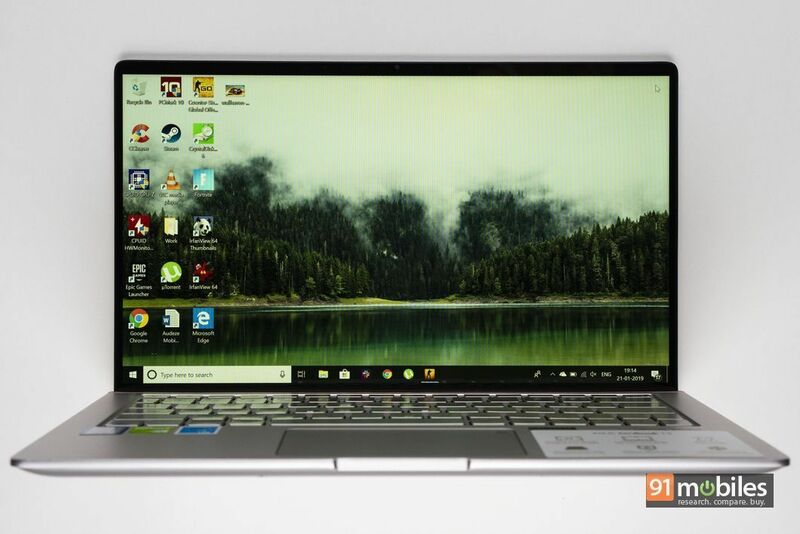 Furthermore, while the touchpad lacks a fingerprint sensor, the laptop makes up for it by shipping with Windows Hello functionality which will allow you to jump into your workflow with a quick scan of your face. During my time with the machine, I found the face recognition to be extremely accurate, so no complaints here. Don’t let the Harman Kardon branding fool you — the ASUS ZenBook 13’s speakers are just not up to the mark. The drivers have been positioned on the underside of the device’s base, which muffles the audio output if you’ve placed the laptop on a bed or your lap. Moreover, even with the laptop positioned on a table, the sound didn’t get too loud and consequently, I relied on my earphones heavily during my time with the machine. 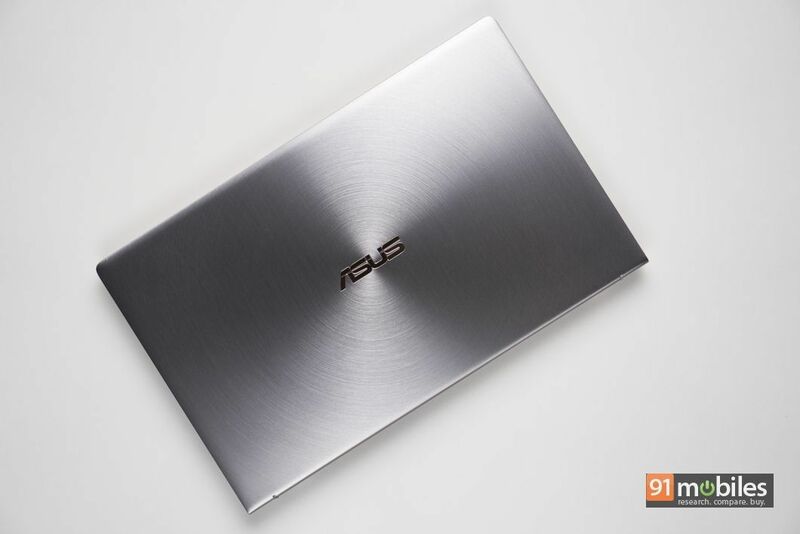 The ASUS ZenBook 13 is a capable little machine and underneath its metallic chassis, the laptop is backed by a quad-core Intel Core i7-8565U processor clocked at 1.8GHz which can turbo up to 4.6GHz. 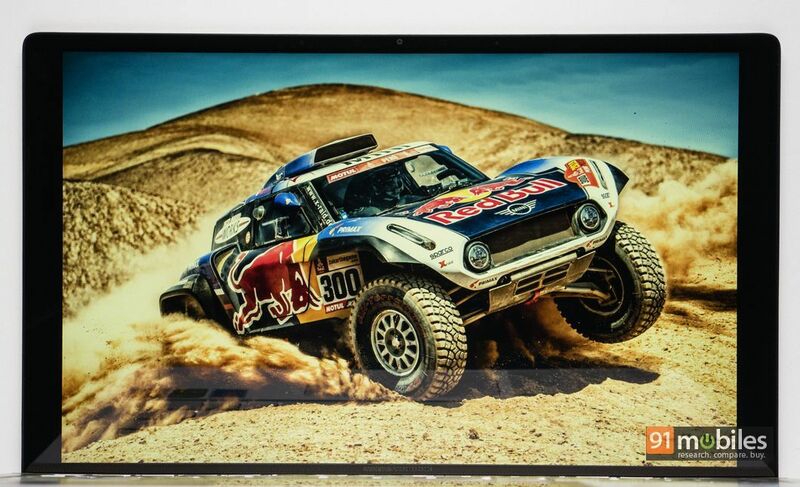 The processor works alongside 8GB of RAM, 512GB of solid-state storage and an Nvidia MX150 graphics card with 2GB of GDDR5 memory. Unsurprisingly, I didn’t come across any performance issues during my stint with the machine. There was nary any lag when I was jumping between applications like Word and Slack, or switching between a dozen or so tabs open in Chrome. What’s more, the dedicated Nvidia GPU can even handle some lightweight gaming and I was averaging over 60fps on games like Counter Strike: Global Offensive and Fortnite at medium to high settings. Unfortunately, the bundled power brick maxes out at 45W and therefore, I was running into throttling issues when gaming for over 30 minutes on a stretch. On the contrary, the MSI Prestige PS42 I reviewed recently also featured an Nvidia MX150 chip albeit shipped with a 65W AC adapter which could keep up with the laptop’s power demands. On to the benchmarks, the ASUS ZenBook 13 put up impressive numbers in various synthetic tests. 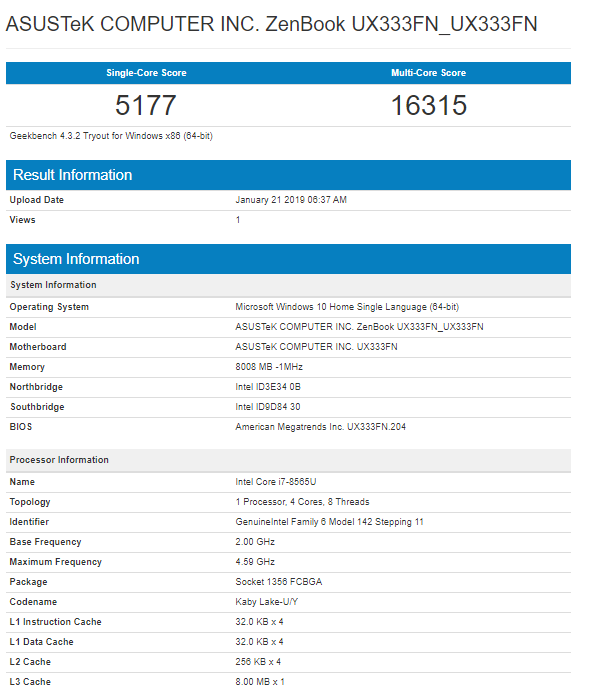 In PCMark 10, the laptop secured 3,864 points, which is significantly higher than the Core i7-8550U toting MSI PS42. 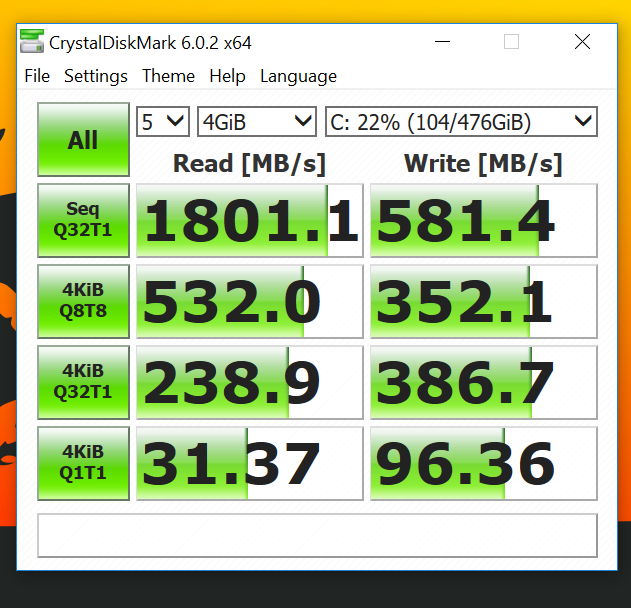 Furthermore, the laptop’s built-in SSD is plenty fast too, and I was averaging sequential read and write speeds of 1,801MB/s and 581.5MB/s respectively in CrystalDiskMark benchmark. Lastly, in Cinebench R15 OpenGL test, the laptop secured 82.42fps, which is on par with other machines backed by similar components. Battery life has been a bag of mixed beans for me. On some days, the ASUS ZenBook 13 surprised me with around eight hours of battery life but on others, I was averaging a little over six hours. Before you get the pikes out, my workflow stayed consistent throughout my review period and the laptop was always set one level below the best performance setting option in Windows. What’s more, barring the Microsoft Surface Book 2 (review), the ZenBook 13 managed to outperform every other laptop I’ve reviewed in our Battery Eater Pro test and lasted almost 4.5 hours. 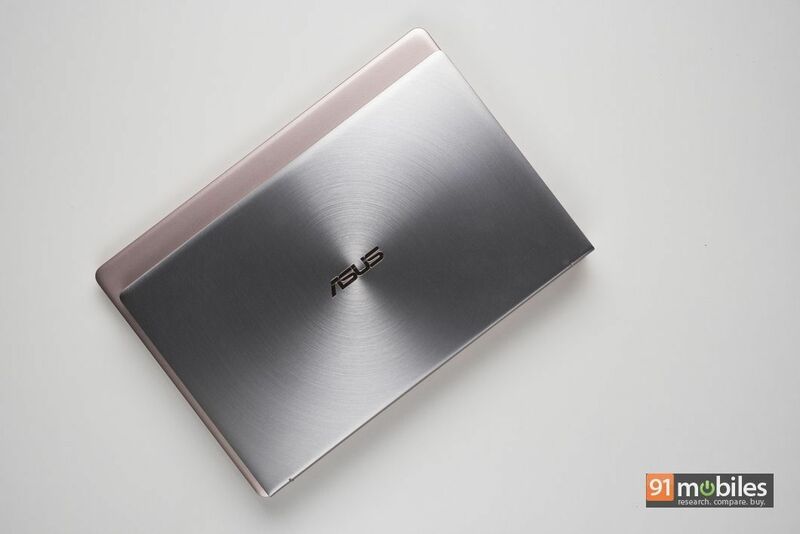 The question is, should you splurge on the ASUS ZenBook 13, given its price tag of Rs 99,990 (the range starts at Rs 89K)? Well, if you want a no-nonsense, uber-portable machine, then I believe you should. The laptop performs extremely well, offers a decent battery life and undercuts the likes of Dell XPS 13 significantly too. While the trackpad leaves something to be desired and the GPU performance isn’t on par with MSI’s PS42, the machine more than makes up for it in other areas. Consequently, the new ZenBook 13 gets a recommendation from me and will make for a great laptop, provided you don’t game on it.